Coleman quality and brand name in a 54 Qt. Classic Steel Belted Cooler with your logo. and metal lock hardware security, easy drain, dual metal hardware handles. Holds 85 12 oz. beverage cans. 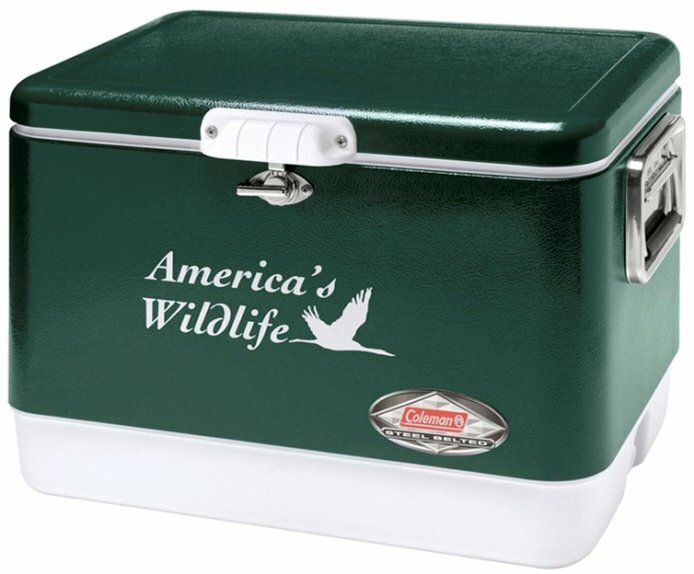 Overall 24 w x 16 1/2 h x 14 1/2 d.
Applications rated as the best overall outdoor activities cooler. Also for Christmas gifts, performance and safety awards. Steel Belted Cooler Colors: Green, Red and Black. NOTE: Black is an option, add $7.00 each unit. Price includes a one color imprint on front in area 13" w x 4" h.
For optional lid imprint 13" w x 8" h duplicate charges below. color add a setup and running charge $1.65 each unit. I ordered 48 of these coleman steel belted coolers for an employee event at the beginning of March and they are still the same great made in the usa quality. I got them in all three colors, red, green and black. I personally like the black the best. White imprint with our logo worked just fine. I know my men are going to be tickled to get one as they are not expecting such a nice gift. Happy customer in Alabama.